I have made and posted many recipes in my first year of food blogging. It's been quite hard to pick one that is the 'best', but I've chosen Fresh Fruit Tart. It not only looked and tasted gorgeous, it required no cooking - which was handy as I was without an oven at the time! Sandra from Un tocco di zenzero and Zorra from Kochtopf have compiled a special a collection of foodblogger's best recipes of 2007 which can be found here. There are some truly magnificent dishes from around the world, take a peek and get some inspiration for next year!! 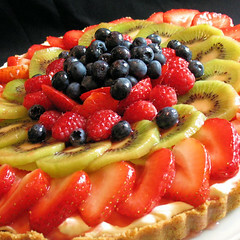 Your Fesh fruit tart looks very stunning!! Wishing you a Happy New year 2008! I remember this fruit tart Nicisme!! I hope to see many more delicious recipes in 2008 coming from Cherrapeno!! !Keep them coming!!! Great recipe Nic. I think my favourite recipe of yours was the Strawberry Cream Cake. Mind you all your recipes are good. Looking forward to more delicious goodness in 2008! A great choice...this tarte looks stunnign and fresh! A lovely photo. A wonderful 2008 to you, I look forward to seeing your work! No cooking? You rock! That is sublime. A very happy New Year to you and the whole family Nic! Your photos of food are always so stunning. Well done. All the best to you too Ronell and Maybahay! Friedel & Andrew - Thank you for stopping by. Take care on your travels - I really love to read about your adventures!